This little jewel is located about 25 kilometers from the main complex around Angkor Wat. Built in the 10th century, it is quite small compared to the big temples of Angkor and is constructed with a pinkish sandstone instead of the gray stone used for the big temples. More importantly, the stone is finely carved to a highly intricate level of detail. So much so that the name, which translates "citadel of the women", is assumed to mean the carvings were produced by women rather than men. 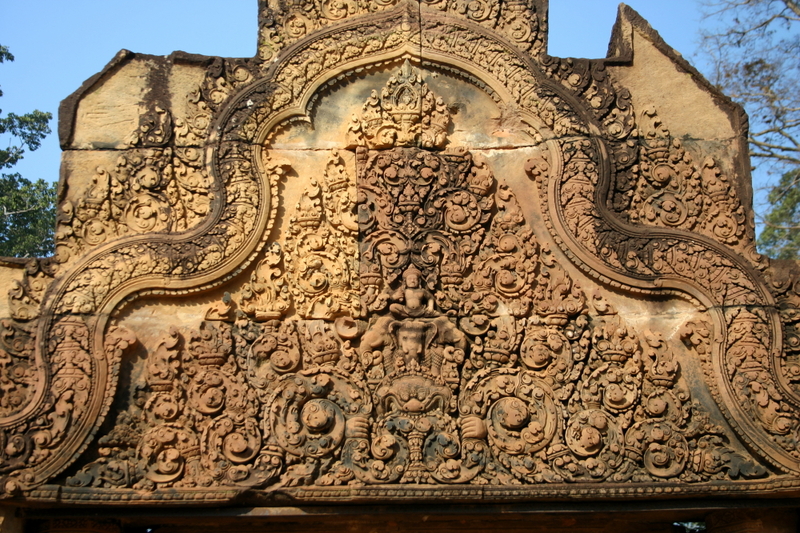 One of the intricately carved panels over a gateway. The temple was built around 967 by a Brahmin counselor to king Rajendravarman, and later, Jayavarman V. Banteay Srei is remarkably well preserved, especially given the delicate nature of the carvings. The temple was the first one of the sites at Angkor to be restored using a method called anastylosis, where the structure is disassembled and then put back together using original construction techniques. Banteay Srei was almost unknown when I first visited it in 1999. It was too far away and the roads weren't so good back then. The road is much better now, and a place this spectacular can't be kept secret for long. The temple is now a fairly regular stop for extended tours of the Angkor temples. If you're on your own, a visit to Banteay Srei can be combined with a trip to Kbal Spean and Banteay Samrei. You can even add Beng Melea for a full day trip. Note: Although removed from the main Angkor Archaeological Park, you must still posses a valid admission pass to visit Banteay Srei. If you don't have one, or yours is expired, you can purchase a one-day only pass at the temple for US$20. Banteay Srei closes every day at 5:00 PM.